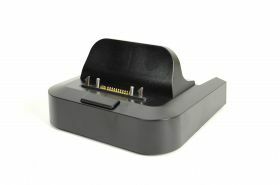 Desktop Ethernet docking station for Mesa 2 Rugged Tablet. Mesa 2 is secured to dock in landscape format. Includes: 12VDC power port, three (3) USB ports (host), RJ-45 ethernet 10/100T port. Dock is designed to be used with Mesa 2 Wall Charger. Ports require external power to be applied. includes Kensington lock slot. This unit does not include an additional power supply. This Dock is needed for all Mesa 2 units with the serial number that is less than 190458.